NYC, 02/14/2019, 7:00PM. 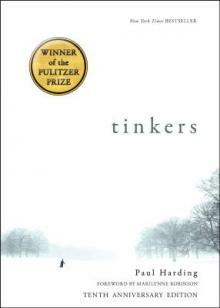 Tinkers: Tenth Anniversary of the Pulitzer-Winning Novel. Celebrate the publication of the deluxe 10th anniversary edition of Tinkers with a conversation between author Paul Harding and Elizabeth McCracken, moderated by Michele Filgate. Paul Harding's modern classic begins with an old man who lies dying. As time collapses into memory, he travels deep into his past, where he is reunited with his father and relives the wonder and pain of his impoverished New England youth. At once heartbreaking and life affirming, Tinkers is an elegiac meditation on love, loss, and the fierce beauty of nature.